Were you there to witness the magic? 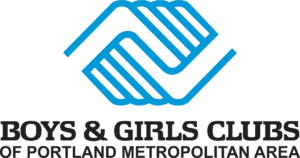 On May 4th, 2018, around 300 generous supporters came out to the Portland Art Museum to join Boys & Girls Clubs of Portland Metro at their annual Be Great Ball. 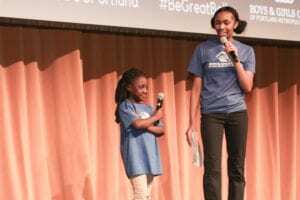 This year was a grand celebration honoring the opening of our newest location last fall, the Rockwood Club in Gresham, as well as the champions who helped make it possible. John Herman, one of those many champions, received the inaugural Roy Ciappini “Be Great” award for his 50 years as a volunteer and advocate for the Clubs. 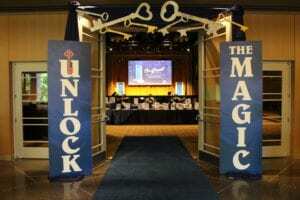 Guests at the Be Great Ball aimed to Unlock the Magic Behind the Blue Door by bidding on auction items and participating in a paddle raise to help our Clubs serve children and teens who enter through the doors of our seven locations every day, providing them with a safe place where they can be themselves. The night began with a cocktail hour, where guests socialized under a magnificent, custom-made archway and competed in the silent auction under a ceiling full of glittering, starry lights. 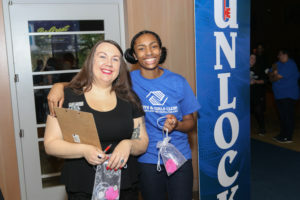 Guests were were able to socialize with our teen members and staff and purchase keys for the Blue Door Raffle, a chance to win a resort vacation to the Oregon Coast or Maui, Hawaii by unlocking one of the blue doors on stage. Tony Martinez from Oregon Fox 12 kindly acted as emcee for the night. Our speakers for the night included Erin Hubert, Boys & Girls Clubs of Portland Metro’s CEO; Shannon Inukai-Cuffee, our Board Chair; and the first Roy Ciappini “Be Great” award recipient for 50 years of dedicated, tireless service to the Clubs, John Herman. With dinner came the real fun — a video and live dance performance from our Regence Club members, led in song by the charismatic auctioneer, Dale Johannes, then steered our Bid Frenzy and Live Auction portion of the night. Prizes included everything from a New York City trip to see Wicked on Broadway, to a gift for ten lucky Club members to spend time with Portland Trail Blazers star CJ McCollum! All in all, the Be Great Ball raised around $550,000 to continue fulfilling its mission of empowering all young people, especially those who need us most, to discover their full potential as caring, engaged, responsible community members. It was a wonderful night, filled with fun and magic! A heartfelt thank you to everyone who contributed to and joined us for this amazing event. We hope to see you again next year!